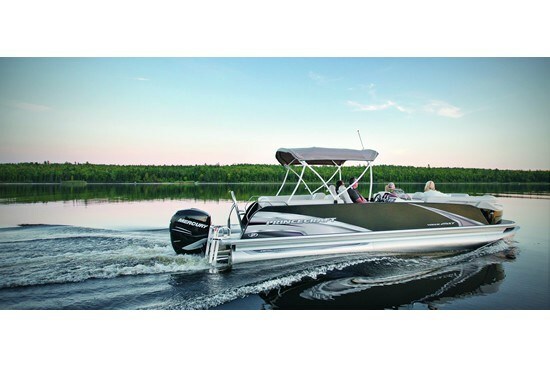 For 2013, Princecraft Boats, Inc. of Princeville, Quebec, offers thirty-four models of aluminum pontoon and deck boats in seven series from fifteen to twenty-nine feet. 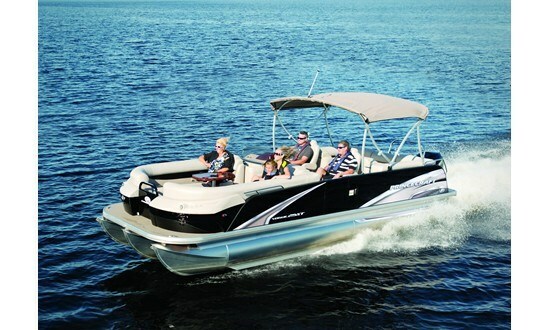 Princecraft also offers forty-three models of aluminum fishing boats, utility, cartop and jon boats ranging from ten to twenty feet. This new Vogue series is comprised of three sizes in 21, 23 and 25 feet in five models, the upgraded “XT” designation being described by Princecraft as “the ultimate in comfort.” The Vogue 25 XT subject of this review, at just one inch short of twenty-six feet length overall on an eight and a half foot beam, differs from the “base” Vogue 25 model mainly in seating configuration. 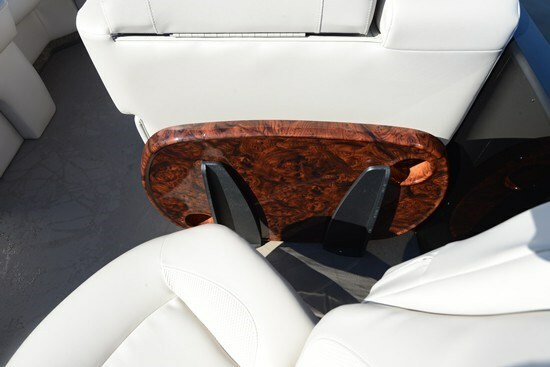 The XT provides “extra-wide” upholstered port and starboard facing stern lounge seats with integrated armrests and a centre stern gate with removable gate seat as opposed to a portside L-shaped lounge with a starboard side stern gate – but no filler seat. 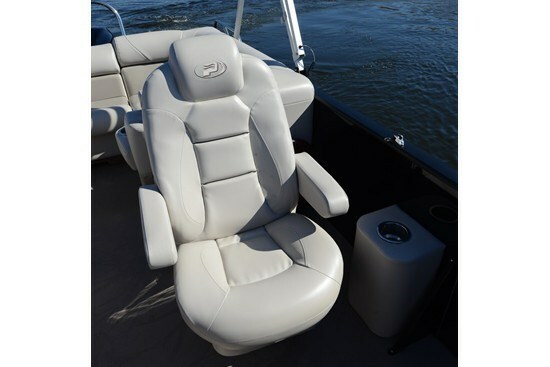 In addition, the XT includes a padded swivel passenger chair with armrests plus a longer portside forward chaise lounge plus a removable bow gate seat. In both cases, the captain gets a swivel, reclining chair with armrests and slider. All furniture bases and backs are Roto-Cast synthetic – not wood. All lounges, including the reclined sections, contain storage. An inflatable bow filler cushion is optionally available. 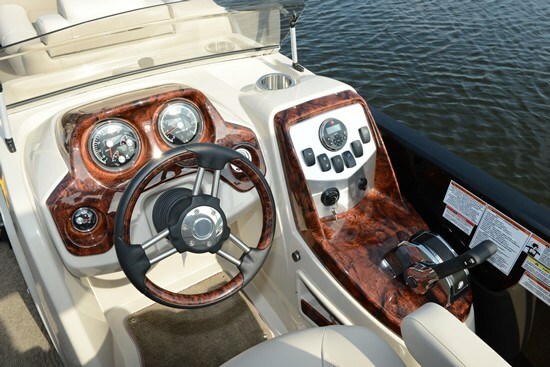 The captain’s starboard side fibreglass helm console with built-in storage and smoked windscreen comes standard with five essential gauges – tach, speedo, volt, trim, and fuel – compatible with your choice of ten Mercury outboards from 40 to 175 horsepower for the standard two-log (pontoon) offering, or an additional five Mercury choices up to 300 horsepower if you opt for the third centre log (pontoon). 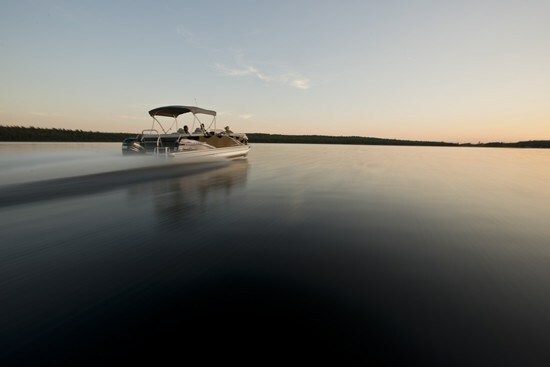 Tilt steering is standard and you may select the optional hydraulic steering and Mercury SmartCraft™ instrumentation. A cooler and galley unit (sink, faucet and portable water tank) is part of this captain’s console and conveniently located on its forward facing side. On this console also is the standard 200-watt AM/FM/CD with USB port/MP3/iPod and SAT Radio compatible stereo with a driver’s remote control and four speakers. A Lowrance® X-4 Pro fish/depth finder with water temperature readout is standard. The stereo may be upgraded to a premium high power unit. 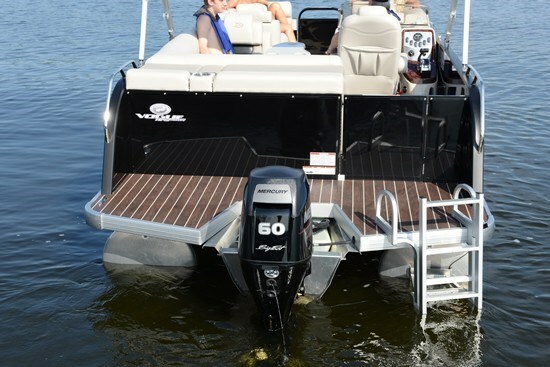 The large full-width swim platform on the 25 XT is vinyl covered in a “teak-look” woodgrain and comes standard with a starboard side folding boarding ladder. Additional standard equipment includes a pop-up privacy enclosure which may be optionally fitted with a built-in chemical toilet on slider w/ holding tank and pump out. Also standard is a bow snack table with dedicated storage. This table may be optionally exchanged for a “woodgrain” table or one with a sliding top and cooler. The standard 24-ounce “Magnitude” pattern carpet may be optionally exchanged for anti-skid vinyl flooring with or without snap-in carpet. A “Buggy” bimini top is standard and this may be upgraded to a double bimini or full camper enclosure. 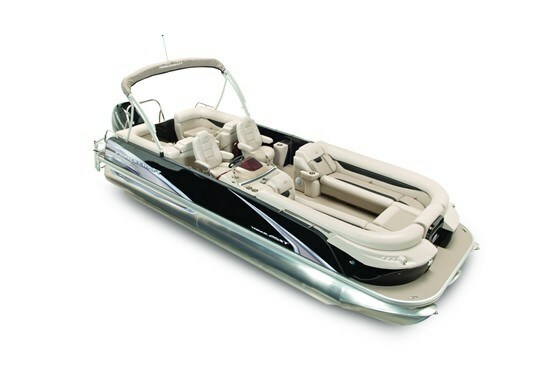 A stainless steel waterski tow bar is also available as is underwater lighting and a BBQ gas grill. One of your biggest decisions may be to opt for the “Speed Package” which includes lifting strakes and under-deck spray shield and available only on the two log model, or go all out and opt for the “Performance Plus Package” which includes the 3rd centre log, under-deck spray shield, hydraulic steering, lifting strakes, and two in-floor storage compartments. These two in-floor compartments are available options on the 2-log model also. 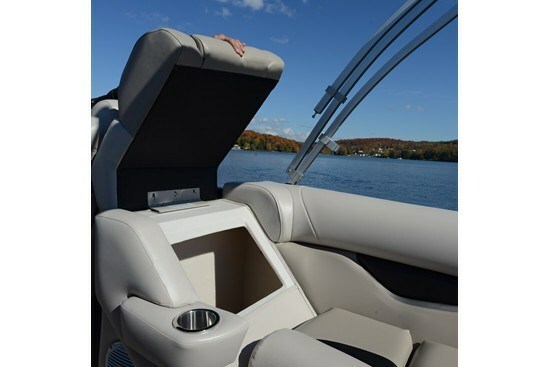 Your choice of these packages will depend on the type of boating you will be doing, in what kind of water in terms of roughness, and your normal loading requirements. Vogue – a new series and a new look from Princecraft.